With a Cold-Shot, you don’t have to drain water lines, sprinkler systems, or hot water systems before cutting pipe or tubing. Our pipe freezing tool keeps a fully pressurized system operating while you make repairs. 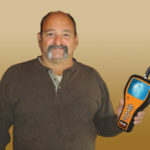 The Cold-Shot pipe freezing tool freezes liquids in metal and plastic pipes ranging from 1/8″ through 2″ (10mm to 60mm) using carbon dioxide (CO2). Dip tube-type CO2 cylinders are available from any welding supply house. The Cold-Shot works faster than “refrigerator-type” units, is more compact and less expensive. It’s faster and uses less CO2 than “bag-type” pipe freezers, because the freeze head makes a better seal around the pipe. 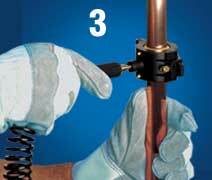 In five minutes you’re ready to go to work on 1/2″ copper tubing, and just three minutes for cast iron pipe. No need to drain the lines before cutting the pipe. 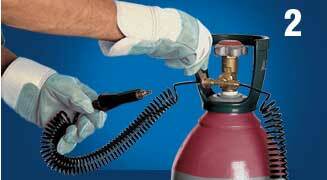 Keep fully pressurized systems operating while you make repairs. 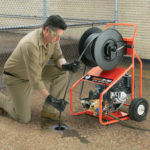 Quickly freezes steel, copper, cast iron & aluminum pipes ranging from 1/8″ to 2″ (10mm to 60mm) in diameter. Uses commercially available and environmentally safe carbon dioxide (CO2). -110°F ice pack is strong enough to withstand 7,000 P.S.I. Quicker and less expensive than electrical freezing units. More efficient and convenient than “bag” type CO2 units. The Cold-Shot is easy to use. 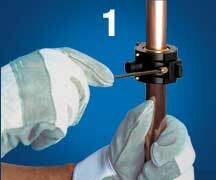 Just place the freeze head around the pipe, attach the hose, and open the cylinder valve. Liquid carbon dioxide will flow into the freeze head and form dry ice with a temperature of minus 110F° (-79C°). That’s cold enough to form an ice pack that can withstand 7,000 psi, yet won’t damage pipes. 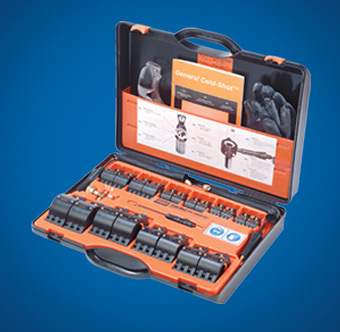 Kit includes 10 sets of freeze heads for 1/8″ to 2″ lines (10mm to 60mm), two high pressure spiral hoses with injectors, T-distributor, locking nut, hex head screwdriver, rubber gloves, goggles and carrying case. The freezing times and CO2 requirements in the table below are general guidelines based on a water temperature 68 F° (20C°). These figures will vary for other temperatures. 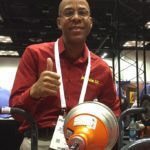 Longer freezing times are required for plastic pipe. Cold-Shot, includes 10 sets of Freeze Heads for 1/8″ to 2″ lines, Two High Pressure Spiral Hoses w/Grips & Injectors, T-Distributor, Locking Nut, Hex Head Screw Driver, Rubber Gloves, Goggles, and Carrying Case.